With the opening of OMA’s Torre for Fondazione Prada, tours of midcentury Villa Borsani, and (a few days late to the Design Week party and thus not included here) the completion of Zaha Hadid Architects’ Generali Tower, Milan Design Week 2018 was exceptionally steeped in architecture. There was the usual abundance of collaborations with architects, such as Alejandro Aravena for Artemide, John Pawson for Swarovski, and David Rockwell’s The Diner with Cosentino and Design Within Reach, but it was the host of architectural installations and interventions that took it over the top. Here are ten memorable architectural moments of Milan Design Week 2018. 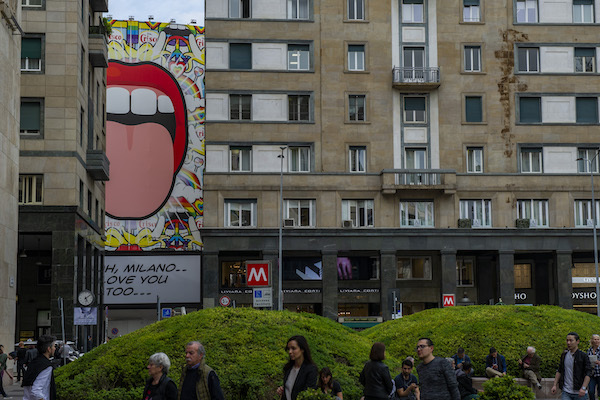 The rationalist 1938 Garage Traversi in Milan’s Montenapoleone District received a facade makeover by Studio Job for Milan Design Week. 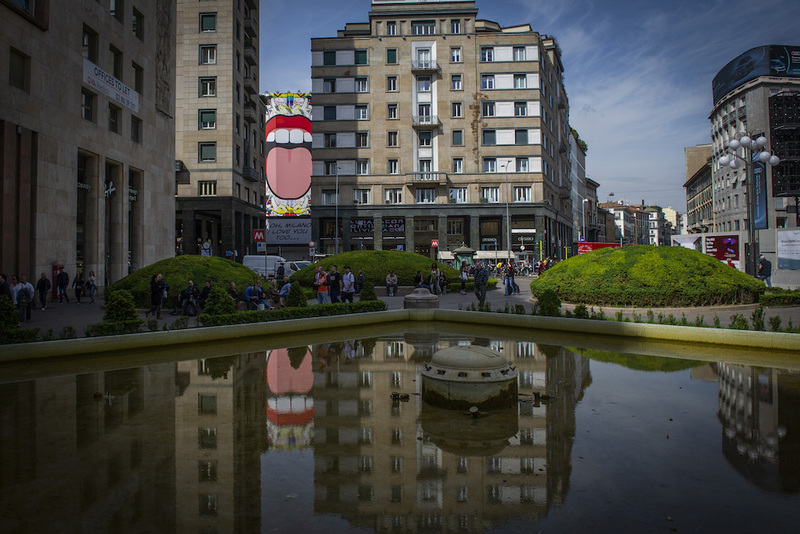 The Pop Art mural comes in advance of the building’s renovation into a “luxury hub” by British private equity fund Hayrish. The reinforced concrete building, originally designed by architect Giacomo de Min, sits on an odd lot, leading to it being built like a fan and resulting in its popularity. The iconic building has been unused for 15 years, but has retained its reputation as a cultural and architectural landmark. PlusDesign Gallery hosted an immensely satisfying architectural exhibition on joints. The group show offered joints of all sizes, materials, and shapes to demonstrate its importance in objects and buildings alike. 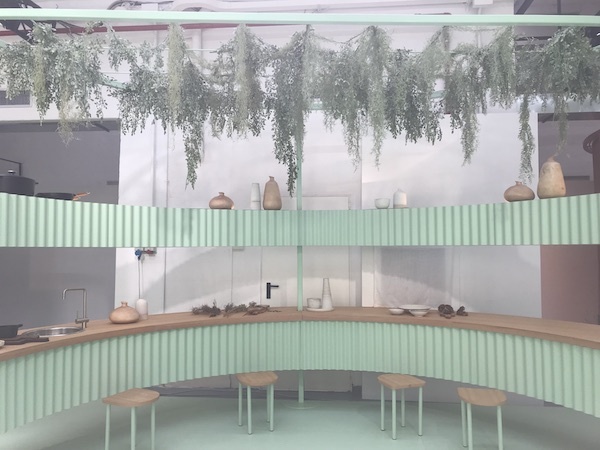 Over 50 designers, studios, and research institutes, including Alvar Aalto, Aldo Bakker, Edward Barber & Jay Osgerby, Konstantin Grcic, Jonathan Nesci, Cecilie Manz, Self-Assembly Lab MIT, and Jonathan Olivares, displayed prototypes and products. 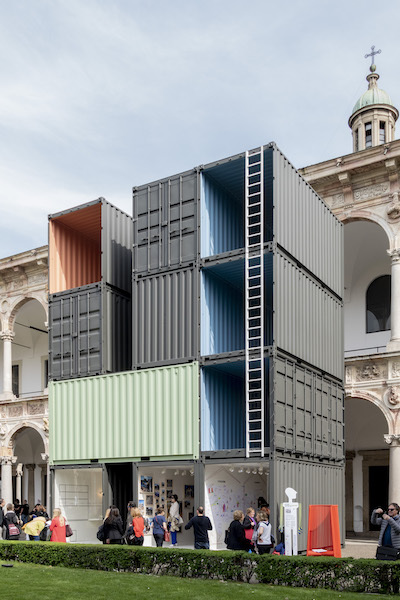 “My Dream Home,” an installation by Piero Lissoni, stacks twelve shipping containers vertically to host an exhibition by photographers Elisabetta Illy and Stefano Guindani of photos taken in Haiti alongside drawings by Haitian children of their dream homes. Lissoni chose to build with containers as an inexpensive, sustainable option that could potentially be used for multi- and single-family homes in Haiti. Snarkitecture’s Caesarstone installation examined different forms of water (Courtesy Caesarstone). 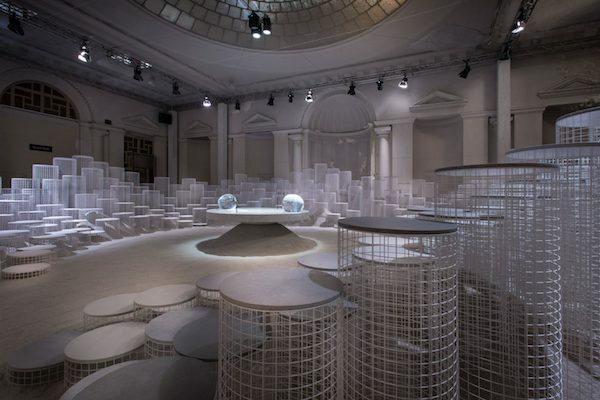 Snarkitecture is no stranger to Milan Design Week installations. 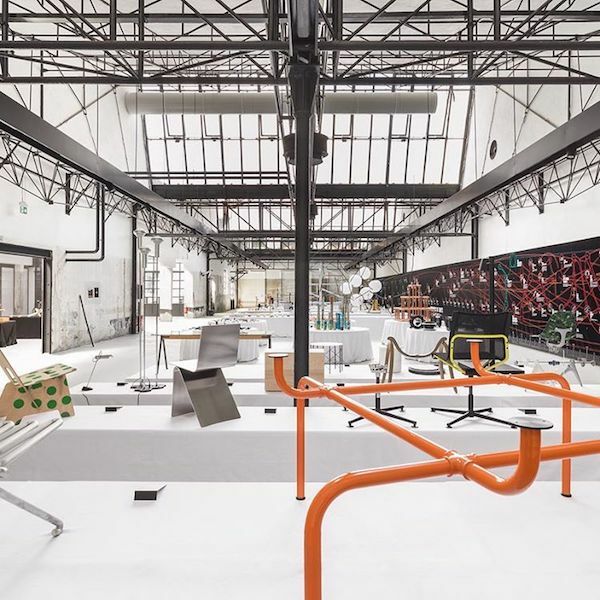 For its most recent, the firm partnered with Caesarstone to create “Altered States” inside the 19th-century Palazzo dell’Ufficio Elettorale di Porta Romana. The installation examined water in its three forms (ice, liquid, steam/vapor) and the way it appears in nature (glacier, river, geyser) through a collection of kitchen islands made from Caesarstone’s quartz surface material. 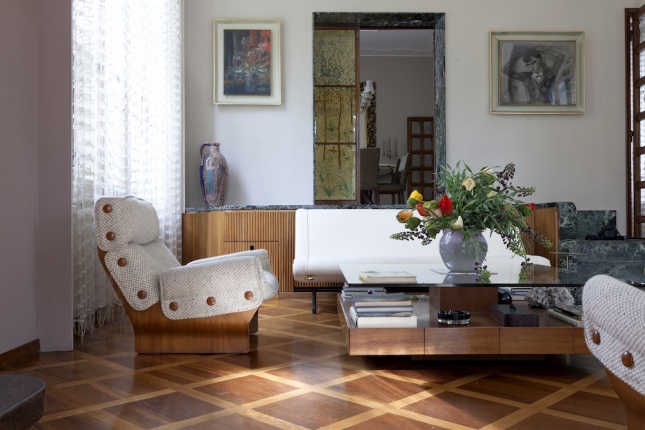 In advance of an exhibition curated by Norman Foster and Osvaldo Borsani’s grandson, the Villa Borsani opened to visitors after being newly decorated by curator Ambra Medda, who collaborated with various artists to bring in floral arrangements, scents, and a playlist that enliven the midcentury villa. 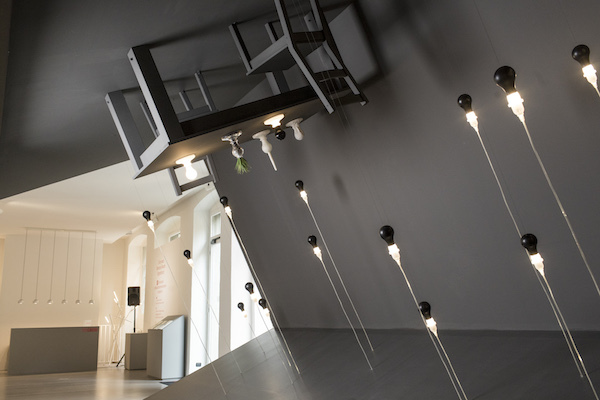 James Wines collaborated with Foscarini to challenge people’s subconscious spatial expectations (Courtesy Foscarini). Fondazione Prada is now complete with the latest building by OMA. (Courtesy Fondazione Prada). 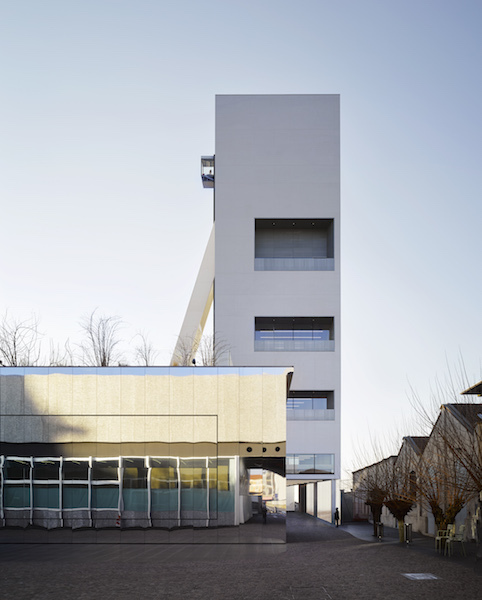 On April 18, the Fondazione Prada completed the latest, and last, building in its 200,000-square-foot Milan complex. Torre, designed by Rem Koolhaas, Chris van Duijn, and Federico Pompignoli of OMA, is wrapped in white concrete and nearly 197 feet tall. This form offers a two-fold experience: From the exterior, the spare, modern block contrasts with the more ornate buildings of the campus (the Italianate-style entry building, gold-painted tower, and the mirror-clad theater, among others) and from the interior, sweeping views of the surrounding industrial neighborhood. Massimiliano Locatelli | CLS Architetti collaborated with Arup, Italcementi, and Cybe to 3-D print a 1,076-square-foot house on-site. 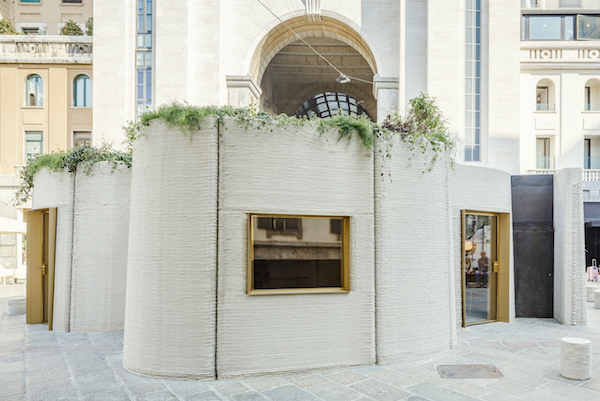 The house, located in front of the Piazza Cesare Beccaria, demonstrated that 3-D printing could be used as a sustainable and feasible construction method. The house was 3-D printed from a recycled concrete that, in the event the house is destroyed, could be reused to make a new structure. 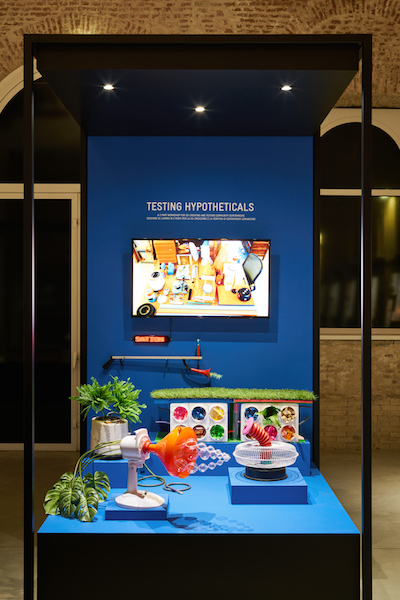 Testing Hypotheticals invites communities to creatively explore the future of urban design (Courtesy Lexus). This year marked two firsts for the 2018 Lexus Design Award (LDA) Grand Prix Winner: It was the first time an American design team took home the prize, and the first time a workshop, rather than a product, won. New York design research studio, Extrapolation Factory, “studies the future” and helps communities create and experience their cities’ futures through workshops and activities. “We all have a vested interest in the future. But how many people have taken a class in futures?” asked Extrapolation Factory cofounder Elliott P. Montgomery. “We’ve had classes in history, math, science, but we are never taught how to think about the future. And this seems like a glaring omission in our country’s education.” Montgomery and his cofounder Christopher Woebken conducted a workshop at the Queens Museum and presented a video alongside a few props as their LDA presentation. The unusual urban planning project garnered praise for its focus on community and its exploration of society, technology, and environment. “It’s completely different than the other participants because it isn’t product-based. It is about education and using design as a way to engage with people, and given the context of the theme, CO-, we felt that was incredibly important,” said Simone Farresin of Formafantasma, who mentored the Extrapolation Factory for the LDA. London-based architecture firm Studiomama created four modular co-living spaces for MINI. Each module had its own color and built-in furniture “totems” that distinguish the space’s personality. The four units share communal spaces, including a kitchen (shown above), a dining area, a gym, and home theater space.